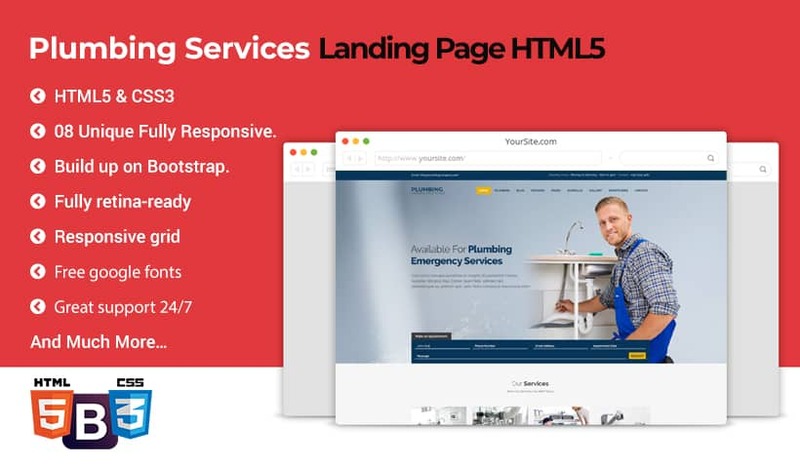 Best Responsive Plumbing Landing Page Template is a powerful, cleaning template that comes with the drag and drop builder. This plumbing landing page is designed for plumbing companies, plumbers and Repairing Services. It is 100% responsive design and tested on all major handheld devices. This template comes with all necessary features for your online plumbing presence like projects, project details, testimonial section etc. 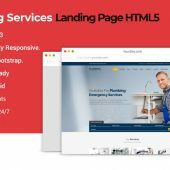 Plumbing Landing Page Template is specially designed to generate more leads for any plumber service business. This template fit for a plumbing company, repair, maintenance, roofing, handyman or any other type of plumbing service. Plumbing Landing Page template is a clean, beautiful and modern design that will be best suited for your web presence. It has 100% responsive design and tested on all major browser as well as devices. This premium Plumbing Services Landing Page template has a professional color scheme. You can change the colors to your own company’s demand. This template comes with creative homepage design layout. This template included various valid HTML and CSS short-codes and files. It is an easily customizable template. We hope so you will feel happy with them. This powerful feature gives you the ability to drag and drop multiple sections to your company landing page. You can also make unlimited modifications to colors, images, banners, sliders contents. Do you know HTML? No? That’s fine, this plumbing landing page template is built for you. You don’t have to have any HTML knowledge to update the contents. Just watch our helping videos or contact our support, we will be able to help you as soon as possible. IT is 100% Responsive landing page template that works in any kind of screen. Different sections have different animations to make your plumbing company more appealing and professional to the clients. Step by step documentation helps you to use the drag and drop builder. Fully documentation is into the download folder. It will help you to use your landing page.